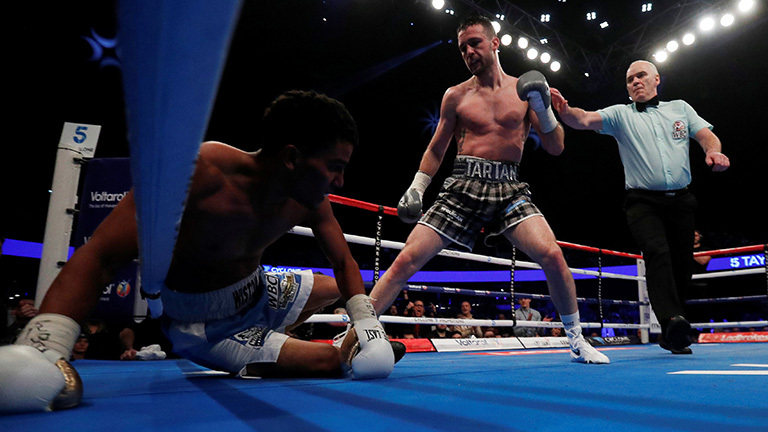 Winston Campos was a late replacement for Humberto Soto and although a late change could be daunting for another fighter, Josh Taylor took it in his stride and produced a dominate performance from start to finish. Before the ring walks began there was a ten-bell salute for English boxer Scott Westgarth, who tragically passed away. It was very disappointing to hear many in the crowd continue to shout and talk over the tribute, which came at a chorus of boos and shhhh. But many did pay their respect the right way to honour the fallen boxer. The atmosphere inside The Hyrdro erupted at the appearance of Josh Taylor and you could see Taylor was buzzing to get underway. From the opening bell Taylor was working well behind his jab and causing Campos problems with his movement. Taylor was landing with nice body shots and constantly moving his head and body to confuse Campos. Campos didn’t know whether to stick or move as Taylor constantly hunted his man down. In the end Taylor looked on another level and the fight was over in round three as the challenger didn’t look like he wanted to continue. He gave referee Victor Loughlin no option but to wave the fight off. The crowd looked happy at the quick result as the exited the bitter cold arena in a positive mood. “I believe in my ability, I always have, I believe I will be a world champion. I didn’t think all this would happen as quick. “Taylor added after the fight.